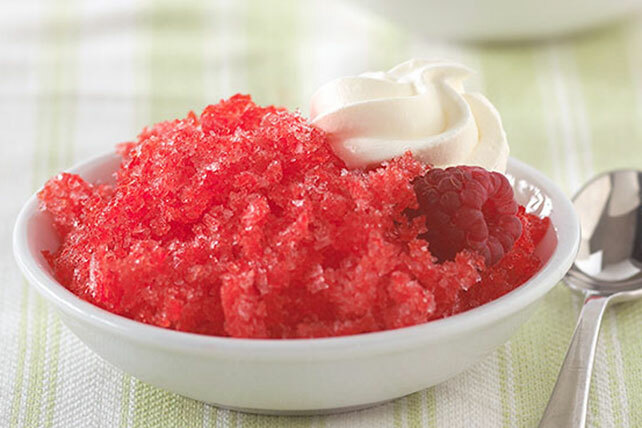 When icy raspberry refreshment is what you want, this fruity treat is the one to make! Watch our video to see how easy it is to put together. Add boiling water to gelatin mix in medium bowl; stir 2 min. until completely dissolved. Stir in club soda, lemon zest and juice. Pour into 9-inch square pan. Freeze 3 hours or until firm. Remove dessert from freezer 10 min. before serving. Let stand at room temperature until slightly softened. Use spoon or fork to scrape gelatin mixture into small pieces; spoon into 6 dessert dishes. Top with remaining ingredients. Prepare using thawed COOL WHIP LITE Whipped Topping and 1 pkg. (0.3 oz.) JELL-O Raspberry Flavor Sugar Free Gelatin. For best results, do not let the frozen gelatin mixture sit at room temperature for more than 10 min. before scraping into small pieces as directed. Garnish individual servings with lemon slices and fresh mint sprigs.